Hard-boiled detective and former muck-raking journalist Max Blake’s discovery of a long-dreaded postcard from Ireland, tucked into his mailbox one morning, is the catalyst that touches off a cross-continent search for his fiancée’s favorite uncle. The Rev. Sean “Jack” O’Lennox, the archbishop of St. Patrick’s Roman Catholic Cathedral in Armagh, Northern Ireland, is missing, and the postcard – a pre-arranged signal – is his apparent cry for help. Max is prepared to do everything in his considerable power to help Caeli Brown, his longtime partner in the Blake & Brown Detective Agency and soon-to-be wife. But she slips off to Ireland without him, and he is left with a double quandary: finding Caeli, and then determining the fate of the archbishop, a complicated man who believes that British-held Ulster should be returned to the Irish Republic by any means necessary. 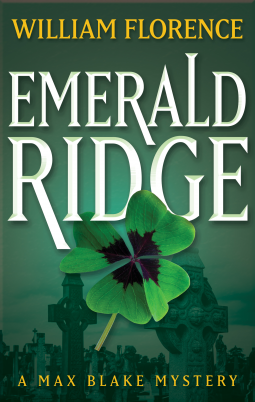 EMERALD RIDGE is a thrill-a-minute sleigh-ride that features unforgettable characters, sleight-of-hand twists and turns providing surprise after revelation after bombshell. Toss in a love story and you have what it takes for a riveting Max Blake Mystery. I was intrigued by the description of this book and it was actually better. An international contemporary mystery that takes place in Oregon and Ireland. Two former reporters, turned private detectives are pulled into an Irish revolt by a postcard from Caeli's uncle the Archbishop of Armagh. Caeli and Blake are aided in their search for her Uncle by the Don Fierro. Lots of action and plot twist. Doubt about who to trust and who's on whose side. This is a great story and it kept me guessing right to the end.